Sometimes you want something sweet for breakfast but you want to be able to tell yourself that it’s along the lines of healthy. If it has whole wheat flour, it must be healthy right? Yes, that’s it. 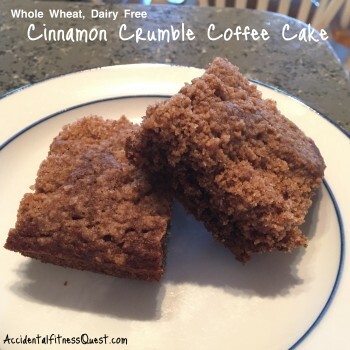 I’m kidding here, but this coffee cake does have whole wheat flour and less sugar than most coffee cakes. I worked hard to figure out the best ratio of wheat vs all purpose the other night so that it still had a lot of flavor. Oh, it’s a tough job taste testing things. Let me tell you. 😉 Because I use oil in it, it’s not as dry as baked goods are when they’re made with wheat. This cake came out nice and moist with a crumbly topping that is slightly crunchy and very coffee cake like. It made the whole house smell amazing too as it baked with all the cinnamon and ginger in it. Preheat your oven to 350 degrees and spray a 9×9 inch baking dish with non-stick spray. Measure the dry ingredients into a bowl and add the wet ingredients. Mix thoroughly to combine. The batter is pretty runny so don’t panic. It won’t be as thick as cake batter but more like pancake batter if I had to describe it. Pour into the prepared baking dish and make the topping. Measure the dry ingredients into a bowl and add the butter. Mix with a fork or pastry blender until it begins to form crumbs. I just kept pressing against the side of the bowl with the back of my fork to mix the shortening in thoroughly. Sprinkle the topping evenly over the top of the batter. Bake at 350 degrees for 35 – 40 minutes. Remove from oven and wait about 15 minutes for it to cool. Cut into 9 squares and serve. Makes 9 servings at approximately 169 calories each – 2g protein, 20g carbs, 9g fat. I had a square of it topped with Greek yogurt for breakfast but it would also make a great dessert cake ala mode with ice cream if you’re so inclined. There’s never a wrong time for coffee cake even if there’s no coffee involved.